The birthplace of America’s automotive industry, over five million people call the Detroit area home. Downtown Detroit boasts a notable entertainment hub, featuring three sports stadiums, three casinos, and a riverfront revitalization project. 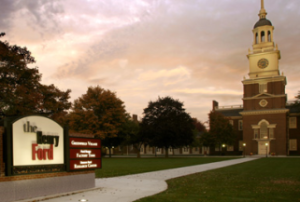 Metro Detroit is home to national historic attractions such as the Henry Ford Museum and Greenfield Village. Whether you are a history buff, a sports fan, or a business traveler, you are sure to find something fun to do in Detroit. The Henry Ford – Named for the famous automobile industry pioneer and founder of Ford Motor Company, the Henry Ford is a world-class indoor and outdoor history museum in nearby Dearborn, MI. Henry Ford Museum features a 12 acre indoor collection of antique automobiles, locomotives, airplanes, machinery, and pop culture items, plus an IMAX Theatre. Greenfield Village is a 90 acre outdoor “living museum” featuring a working farm, nearly 100 historic buildings, live artisan demonstrations such as glass-blowing and pottery, and a vintage transportation system featuring Ford Model T’s and a steam locomotive. Splash Park – If our massive indoor heated pool isn’t enough for you during the summer season, check out the Splash Park next door. 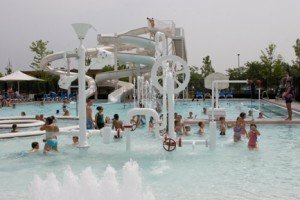 Less than a five minute walk from your Holiday Inn accommodations, the Downriver Family YMCA Splash Park features over 10,000 square feet of outdoor summer fun, a giant water slide, water toys, and a poolside cafe. 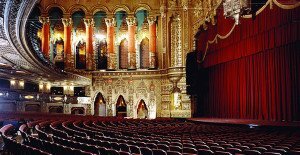 Fox Theatre – Known as “Detroit’s crown jewel,” the historic Fox Theatre is a performing arts center in downtown Detroit. One of five Fox Theatres built nationwide during the roaring 1920s, the Fox Theatre features an Art Deco architectural style with a blend of Burmese, Indian, Persian, Chinese, and Hindu motifs. The Fox Theatre was restored in 1988 and designated a National Historic Landmark in 1989. Located 13.5 miles from Holiday Inn Southgate, the Fox Theatre features a full calendar of performing arts events for all ages. Ford Field – Opened to the public in 2002, Ford Field is home of the National Football League’s Detroit Lions. Ford Field is an indoor stadium located 15.4 miles from Holiday Inn Southgate. If you are a major league football fan, make sure to catch a Lions game at Ford Field this season. Comerica Park – Opened to the public in 2000, Comerica Park is home of Major League Baseball’s Detroit Tigers. Comerica Park is a ballpark located 13.7 miles from Holiday Inn Southgate. If you are a major league baseball fan, make sure to catch a Tigers game at Comerica Park this season.